The city of Celle is a quaint little town north-east of Hanover, with the old town centre full of Fachwerkhäuser. 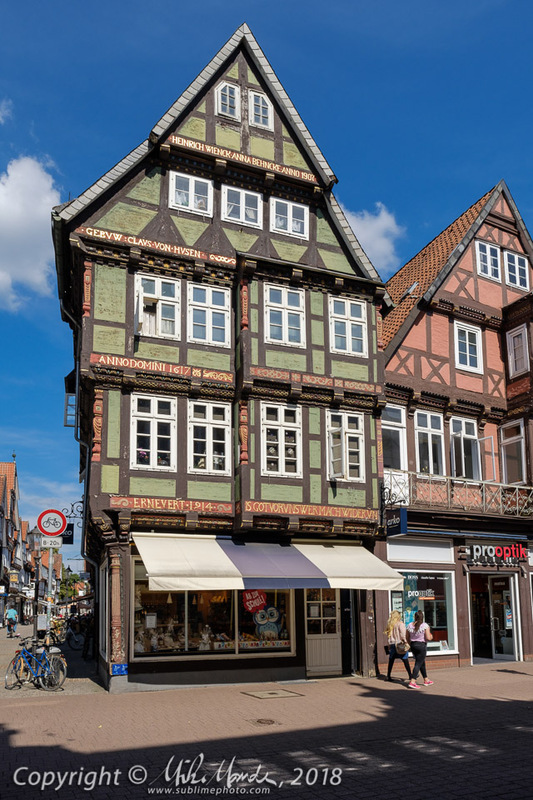 In the above photo, one can see construction that is quite typical in many places in Germany, houses or buildings that have upper floors that progressively extend beyond the lower floors. There were likely numerous different reasons why this was done, perhaps to maximize living space without crowding the streets below or to shelter the lower walls from inclement weather. Another theory I've heard, was that it was done to maximize space but also minimize property taxes since those were once based on just the area of the ground floor. Just before the trip, I received my Venus Optics Laowa Zero-D 9mm f/2.8 lens for my Fujifilm X-system, and since returning, I have spent a fair bit of time examining images from that lens closely. While it isn't perfect, considering how wide a lens it is (equivalent to a 13.5mm on a full-frame 35mm), how compact and lightweight it is, and the fact that true to its name, it really does effectively have zero barrel distortion, I have been very impressed with its performance. 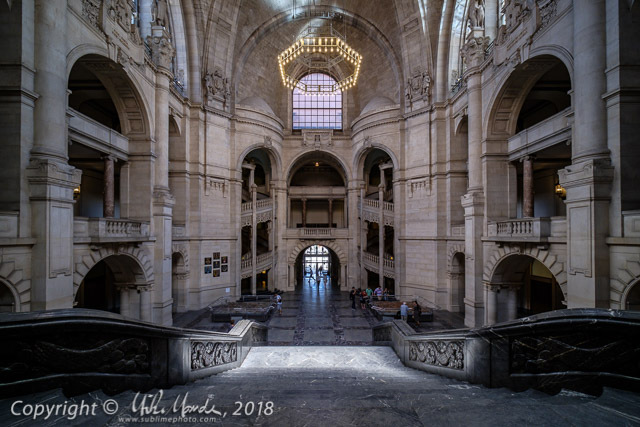 The "new" city hall in Hanover, which opened in 1913 and took about 12 years to build, is an impressive building with a huge cathedral-like interior and lots of baroque detail. It was the perfect place to use the Laowa 9mm lens, which did a good job of encompassing much of the huge interior into single frames. Making an effort to keep the lens level eliminated the sloping perceptive distortion that any such a wide lens would exhibit, which is dramatically visible on a few photos that I intentionally shot that way. Overall, I am very happy with how the 9mm lens performed, and generally speaking, it was a very successful day of photography, with a sky that cooperated as well, giving some nice, fluffy white clouds! To read a more detailed evaluation of the Laowa 9mm, one that I wrote just before I left on the trip, see Beau Photo's July 2018 Newsletter - July 2018 PDF.